With a couple of months to the beginning of 2018, Kenkosansai has started to take pre-orders for official Pokemon Osechi meals. 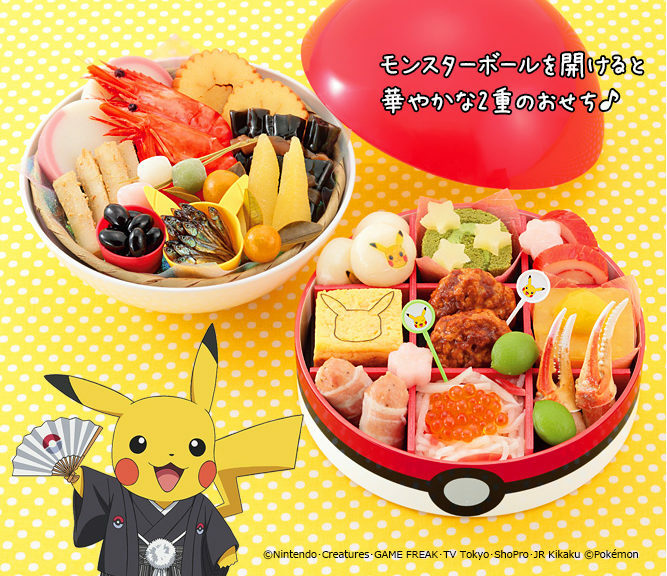 The 2018 Pokemon Osechi comes in a giant PokeBall bento box. The box has two compartments storing food. The first compartment features dishes such as meat rolls, egg, salmon roe, and Pikachu pastries. The second compartment contains more traditional Osechi dishes such as prawns, black soybeans, and Tazukuri. As a small bonus, every Pokemon Osechi set purchased comes with 2 small plates featuring Rockruff and a Pokemon themed Luncheon mat. If you’re living in Japan, the Pokemon Osechi is now available for pre-order for 10,584 yen here. It ships on December 30, 2017.